According to INEC, Obiano defeated two major opponents, Tony Nwoye of the All Progressives Congress and Obaze Oseloka of the People's Democratic Party (PDP) to clinch the victory. The Governor won with a big margin in key areas of the state including Idemili, Onitsha, Orumba, Ihiala, and Awka. 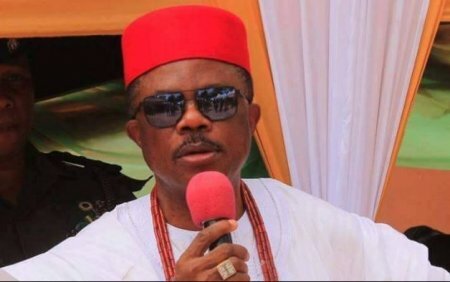 Mr. Obiano also won in Ogbaru local government, the local government where PDP’s Oseloka with a total vote of 6,615 against 3,415 votes got by Mr. Oseloka. Mr. Willie Obiano will continue to drive the state until November 2021 to complete his two terms in office as Governor of Anambra state. Total Votes Cast - 14,172. Total Votes Cast - 18,064. Total Votes Cast - 15,811. Total Votes Cast - 14,087. Total Votes Cast - 20,934. Total Votes Cast - 15,520. Total Votes Cast - 24,541.